Anyone looking to understand the history of the Brontes must visit Thornton as it was undoubtably one of the most inspirational places for them to live. Probably the happiest times of their lives too whilst they all enjoyed good health and their mother Maria and sisters, Maria and Elizabeth, were still alive. 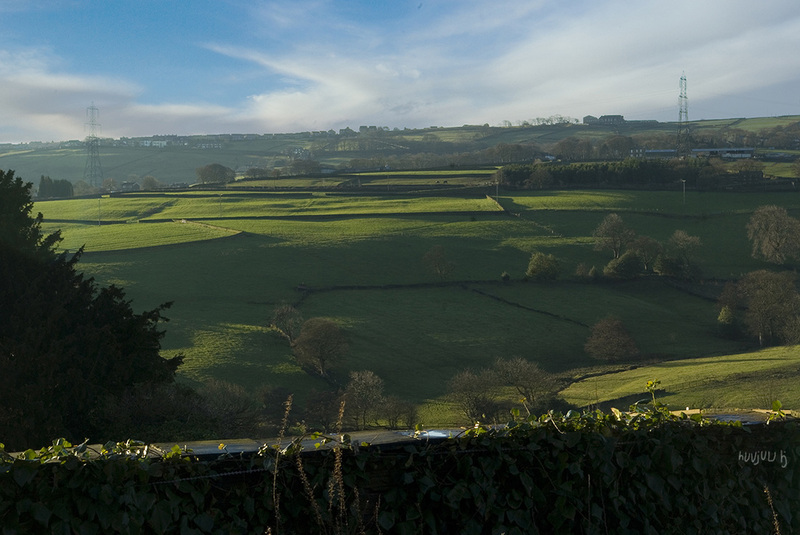 The view across the valley from Thornton. This was taken near the Bell Chapel and looks over the valley toward the ancient settlement of Cockham, now lost beneath the fields although you can still see the shadows of the outlines of its buildings at sunrise and sunset. Cockham also has its own legend that would have been known of by the Brontes. The treasure of soil hill. The travellers were later captured but would not reveal the exact location of the box, but they left clues for any of their friends who may have come looking for them (Knights Templars !). The box was eventually recovered and taken to Haifax although its exact location remains a mystery. Some have suggested it is now in All Saints cathedral, Halifax. During the second World war Hitler sent over a spy to recover the box and head but he was captured whilst digging in the cathedral grounds. It has been suggested Hitler wanted it for the Thule society.